Pressing: Why is it so Important? Most sewers learn early on that there's a difference between ironing and pressing and that when sewing, one should press. There's a great deal that sewers can find to read about pressing techniques, but the concept is not difficult to understand. Ironing a laundered linen tablecloth to take out the wrinkles and make it look smooth is a different process than pressing a garment or project as it's being constructed. To press, instead of bearing down on the iron and rubbing its hot surface back and forth across the cloth with pressure (ironing), pick up the iron and then set it down on a different part of the cloth, applying heat to the cloth with only a small amount of pressure. It's not hard to do, but why is this difference so important? 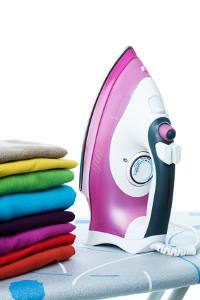 In contrast to ironing, pressing smoothes or manipulates a specific area of the fabric in a controlled way. Envision pressing open the side seam of a skirt. Below the hip, the seam allowance can be pressed open on a flat surface; but it's difficult to press the curve of the hip on a flat ironing board. However, if a tailor's ham is placed underneath the hip curve of the skirt, the rest of the skirt falls out of the way, which enables you to efficiently press open the hip seam allowances, as well as to build roundness into the hip of the skirt. The end result is a more flattering garment, because shape and three-dimensionality are being created. Pressing seams after they've been sewn not only controls the seam allowances, but it also causes the thread to meld into the fabric. This melding process is important, because without it, the thread sits on the surface of the fabric. If you've ever wondered why the garments of certain sewers always look so "finished," it's a safe bet that every one of their seams has been carefully pressed. And it's especially important to press a seam before sewing another seam that will cross it. There are many rules of thumb as well as individual preferences when it comes to pressing with a dry iron or a steam iron; using a press cloth or a Teflon shoe (that attaches to the iron) to protect the cloth; or using a spray bottle of water or a dampened press cloth. Most people who sew find what works for them through experimentation and experience. Mishaps are inevitable, but learning to test press using a scrap of fabric after your garment has been cut out, but before you begin construction, will save you from making serious - or ruinous - mistakes. Once you grow accustomed to pressing each and every seam, you'll find that your garments and projects acquire a shape more quickly. And pressing creates a kind of "memory" in the fabric. Press a curve into a bias strip, and the strip will retain its shape; press a bodice princess seam over a tailor's ham, and the shaping for the bust will remain. Sometimes it seems that you can perform magic by just taking the time to press.